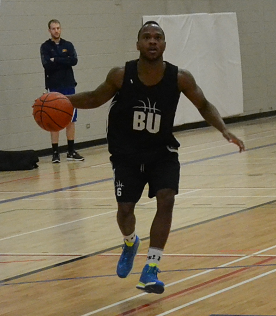 The playoff chase kicks into high gear for the Brandon University men's basketball team as they open a home-and-home series against the Winnipeg Wesmen, which begins Thursday night at the Healthy Living Centre. "We know where the standings are, we know who we have to beat, who we have to catch. It's better than asking for help or needing this team to do this, do that," coach Gil Cheung told CKLQ's Tyler Crayston. "We got to take care of business, we got to continue to play our game and play the best basketball we have all season. It's going to be a challenge; they're a very good team." The Bobcats are trying to track down the Wesmen who hold the fourth and final playoff spot in the Prairie Division and sit eight points ahead of BU. "If I told you I didn't think about it, that would be a lie, but you guys want to see us win. I understand the media and the fans making it a big game. We just want to deliver for you guys," said third year-guard Ilarion Bonhomme. On the women's side, the Lady 'Cats are riding their first three game winning streak since joining the Canada West conference in 1999. The BU basketball teams both have records of 5-9. Game times on Thursday are 6 p.m. and 8 p.m. at the Healthy Living Centre with the rematches Saturday in Winnipeg. Meawhile, the BU volleyball teams split their matches on the road Wednesday night against Winnipeg. The men's team suffered their fifth straight loss after being swept by the Wesmen. Sebastien Steigmeier had 10 kills for the seventh-ranked Bobcats, who are 7-10 and are now two points back of a playoff spot. The second-ranked women's team knocked off Winnipeg in four sets to improve their second-place record to 13-4. Vaovai Aiono had 17 kills and Donata Huebert put up 35 digs for the Lady 'Cats, both were match highs.